UnitedStyles outsources all garment production to Chinese digital textile printers, and because it doesn’t create any of its own inventory it avoids the traditional fashion industry ill of surplus product. Users can buy customized creations for $49.95 for a top and between $79.95 and $99.95 for a dress and van der Chris hopes to reduce its current one month shipping times down to a week — In addition, the first 100 orders today will get free shipping. 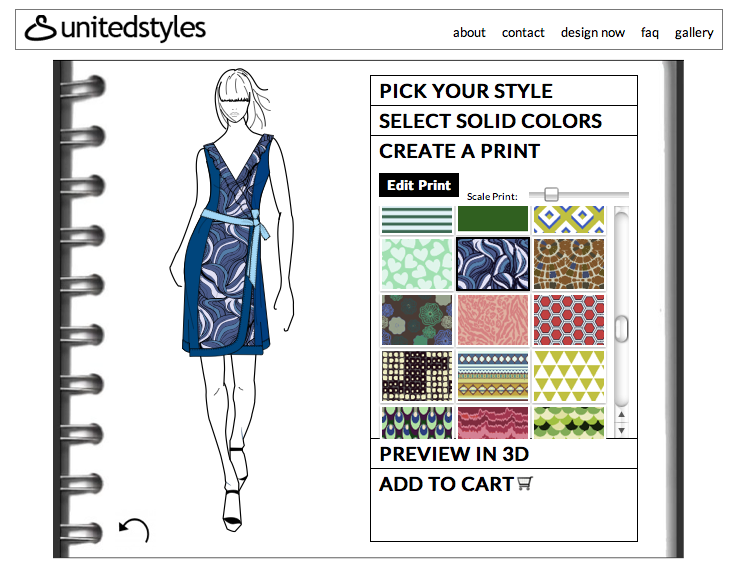 UnitedStyles plans on expanding into men’s clothing and further improving its user experience, eventually making it easier for people to mass design clothing, “We ultimately want people to have fun with design in fashion,” van der Chijs said. Q: Who are your intended users? This seems very niche. A: Fashion is niche, even Zara and HM have 2% of the market, so niche isn’t something we’re worried about. Q: What about the digital textile production technique? Do you do all the printing? A:The digital printing machine needs to be managed by people who are experts, so we outsource the digital printing. Q: Is virality your main marketing strategy? Q: Where is your target market, China, America? Q: Do you think this is too long? A: People are buying for the experience, not for the speed in receiving the product.